The European Commission has proposed tighter emission caps on cars, to be enforced with steep fines. 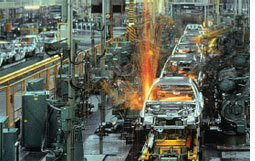 The plan will fine manufacturers for every gramme of co2 emitted beyond the limit, with penalties that will begin at 20 (us $29) in 2012 and rise to 95 (us $137) in 2015. Automakers as well as environmentalists severely criticized the plan, with the latter saying it will not help the eu meet its commitments. Stavros Dimas, eu environment minister, disagreed. "Cars account for 12 per cent of overall co2eu," he said. Unveiled on December 19, the plan will force carmakers to reduce co2 emissions from new cars sold in the eu from the current 160 grammes per kilometre to 130 grammes starting in 2012. European carmakers had previously promised to meet a voluntary target of 140 grammes by 2008. But this would not have yielded the desired results, making the tougher action necessary, says Dimas. The plan is subject to approval by the eu parliament.